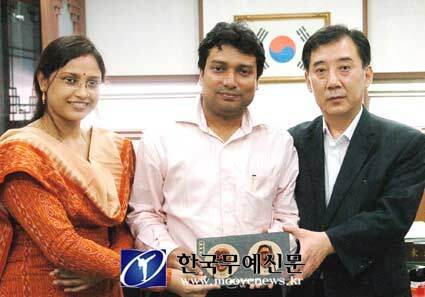 According to the statement given by GyeongGi-do Taekowndo Association (President Park Yun Guk), President Park Yun Guk (formermayor of Pocheon City) is planning to visit India between 31st andFebruary 4th in order to promote the establishment of a Taekwondocollege in the City of Calcutta, the State of Bengal, India. President Park will meet the majority andminority floor leaders and the key figures of the government in order to enterinto the agreement for the establishment and administration of a Taekwondocollege. President Park said, “Through thisagreement, for the first time within 40 years after the establishment of thediplomatic relations with India in 1973, we are now able to found a Taekwondocollege abroad.” He also said, “Such effort will be helpful for the developmentof Taekwondo in India and the foreign expansion of those graduating fromTaekwondo colleges in Korea. 경기도 태권도협회(박윤국회장)는 인도 벵갈주 캘커타시에 태권도대학을 설립하는 일을 추진하기 위해 박윤국 회장(전 포천시장)이 31일부터 2월4일까지 인도를 방문한다고 밝혔다. 박 회장은 벵갈주 여야 원내대표, 정부 요인 등을 만나 태권도대학 설립·운영을 위한 협약을 체결할 예정이다. 박 회장은 “이 협약을 통해 1973년 인도 정부와 국교 수립 후 40년 만에 최초로 해외에 태권도대학을 설립하게 됐다”며 “인도 태권도 발전과 국내 태권도 대학 졸업생들의 해외 진출에 도움이 될 것”이라고 말했다.